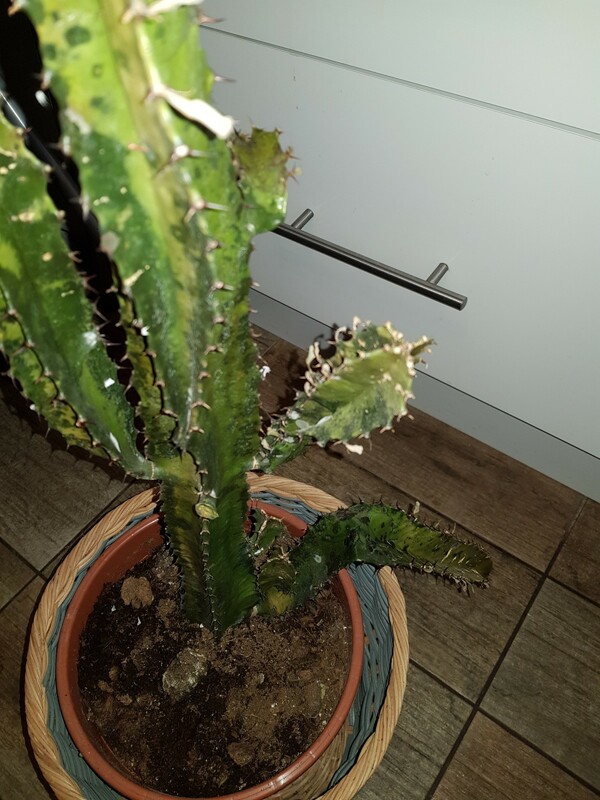 I accidentally forgot to bring my cactus inside when it started getting pretty cold outside (0°C). It looked fine a few weeks ago and then I had a look and it had loads of black/brown spots all over it with mouldy white spots. One of the stems was completely wilted and the rest of it is all skinny as if the life has been totally sucked out of it. Is it rotten? 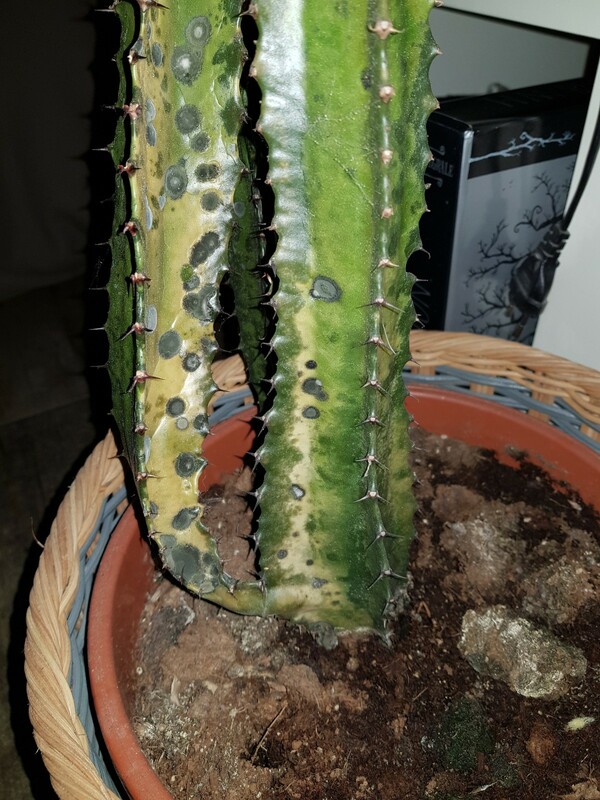 I bought the cactus inside and cut off the one wilted branch that had a lot of black and white mouldy spots, only to find today that another stem has drooped in the same way! The main central stem has gone all yellowly too. I think you may have a Weberocereus cactus. The best thing to do is to not cut any black parts off, but rather, wait until a sunny spring day and put it out in the warm weather. 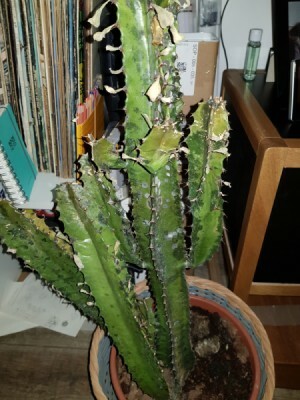 At this time you can cut off whatever needs to be cut off, the black or soft parts of the cactus. This will give the plant a chance to grow some more and recuperate. Doing anything at this time, would be stressful for the plant. My mom has something similar that lives on the window sill in Pittsburgh, which means it gets hot in the summer and cold in the winter. It is fine. It keeps going even when it gets black and white yuck on it in the winter. It falls off and new growths start in the summer. When my dad was alive, he would cut the black parts off, but since he is gone all these years, my mom leaves it alone, and it thrives with benign neglect. That all said, I would just leave it be and it should heal itself. The black parts may fall off (or you could cut them off), but best to let it heal itself!! 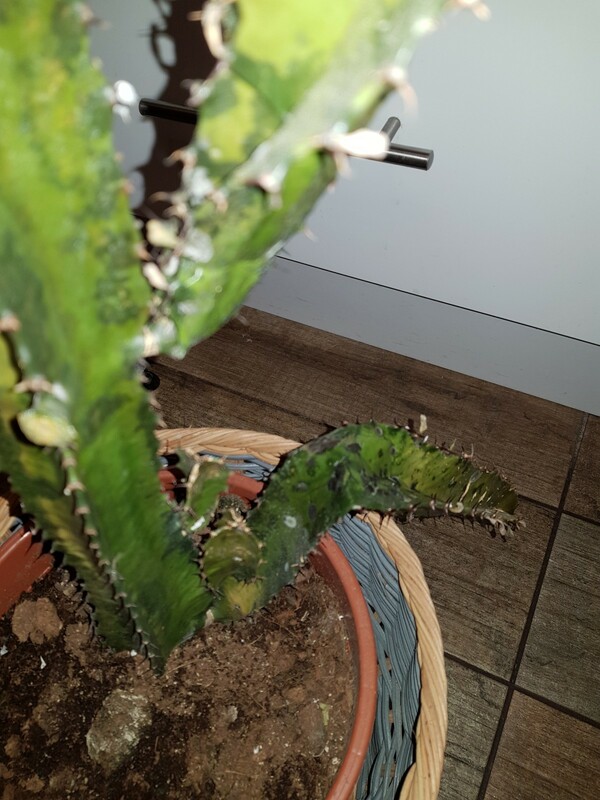 Unfortunately it is not a cactus it is an euphorbia, it could be euphorbia trigona or euphorbia triangularis or euphorbia lactea. I wrote "unfortunately" because they are more gifted than the cacti to hide the rot that is killing them from inside and to suddenly drop dead completely rotten when it is already too late to try to save them. The only thing you can do is to put it in a warm dry place in full light and to do not give it any water at all. It could even be a good thing to try to dry its soil by taking the plant out of its pot and wrapping around the soil some newspaper pages, changing the papers every day until it is completely dry. 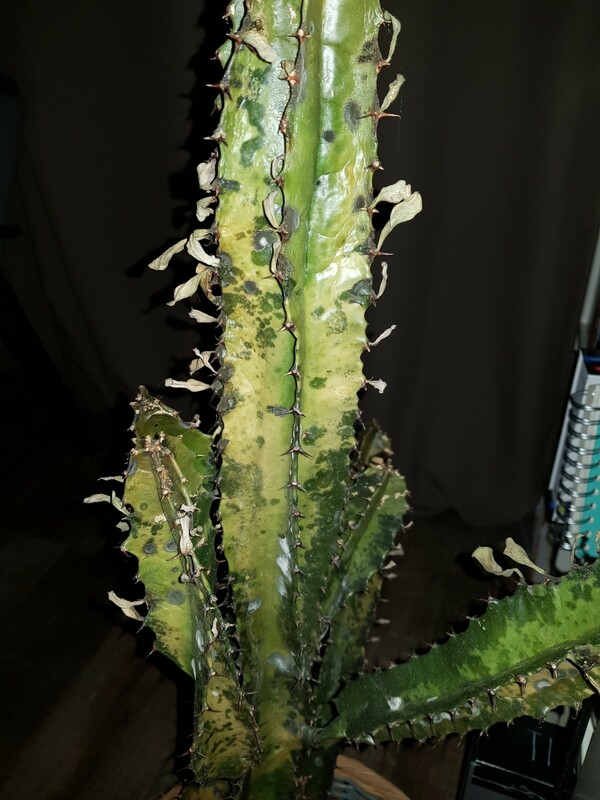 Even for an euphorbia in good health the care is the same : dry warmth, direct sunlight and only a small amount of water on the hottest summer days only, and no watering at all in the winter. It is even better in the summer to only water spray the plant in the evening. You could also cut neatly with a razor blade 10 or 20 cm from the top of a branch and leave it on a piece of paper to dry, for at least one or two months, check that the cut is clean and drying without rotting every day. 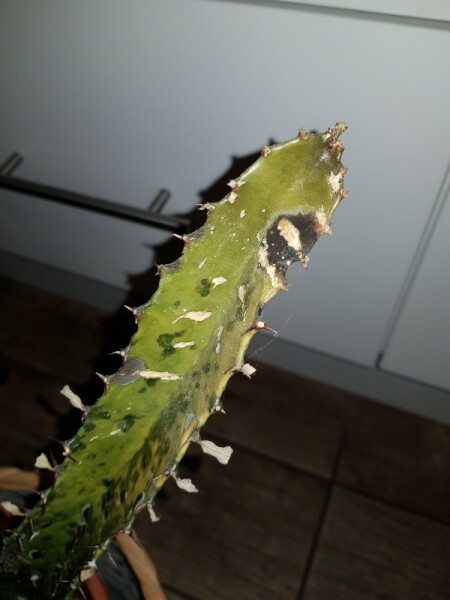 Once the cutting is completely dried (the cut will be covered by a sort of white skin) you can put it in soil, this is to start a new plant in case the mother plant doesn't not survive. Good luck !